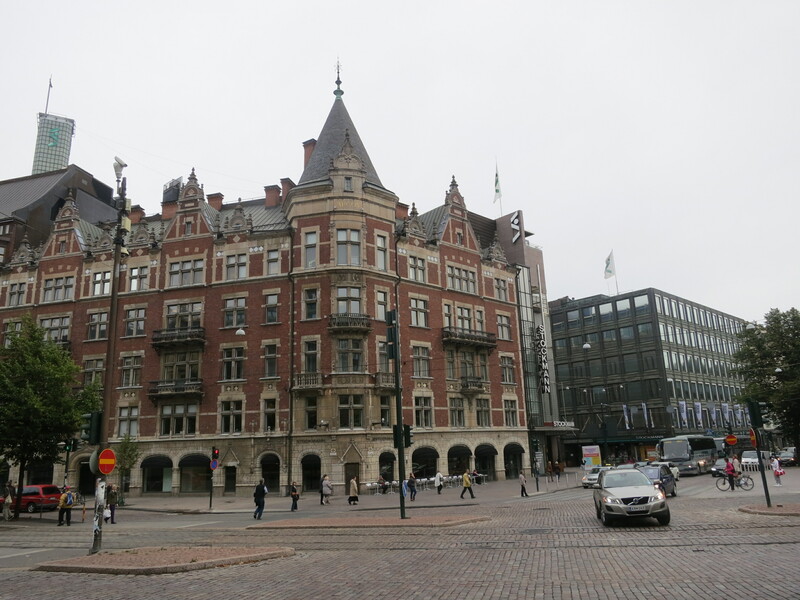 The third port of call on our Baltic Capitals cruise was Helsinki, Finland. Talk about a place we don’t know anything about! If someone were to ask us what Helsinki is known for, we would have a hard time coming up with an answer. After spending the day there, we still can’t give a great answer to that question, but we can at least speak to it with a bit more confidence. In order to make the most of our day, we got up bright and early, disembarked from the ship and made the lovely 30 minute walk from the cruise port into the city center. One of the first things we noticed in Helsinki was the number of public art projects scattered throughout the city. 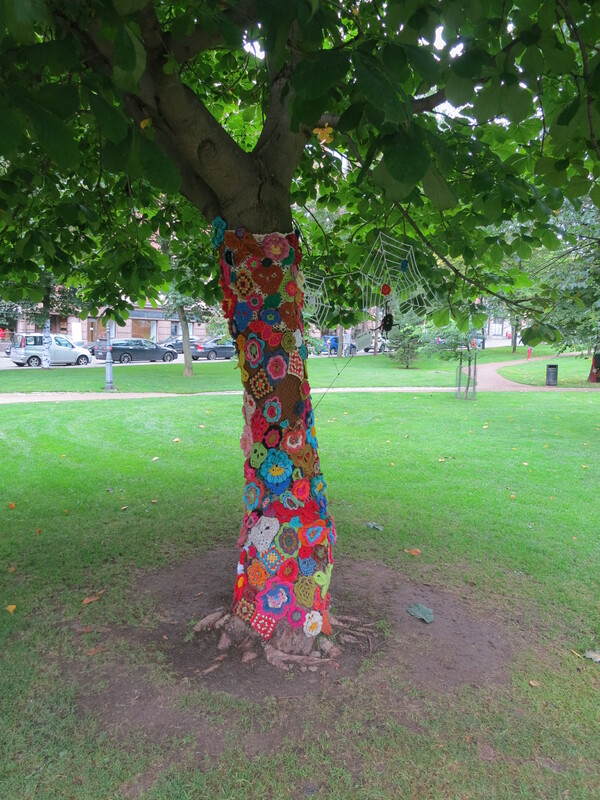 We came upon a park which had “knitted graffiti” covering many of the trees. Essentially, people have knitted all kinds of patterns–stars, sunshines, flowers, etc.–and covered the park’s trees with them. It is an interesting and surprising twist on the idea of graffiti. We also noticed these red tags on many of the major landmarks. A project called “Helsinki Tagged” has 80 different red tags spread around different landmarks throughout the city. Each one has a quote which shares someone’s memory of that spot. 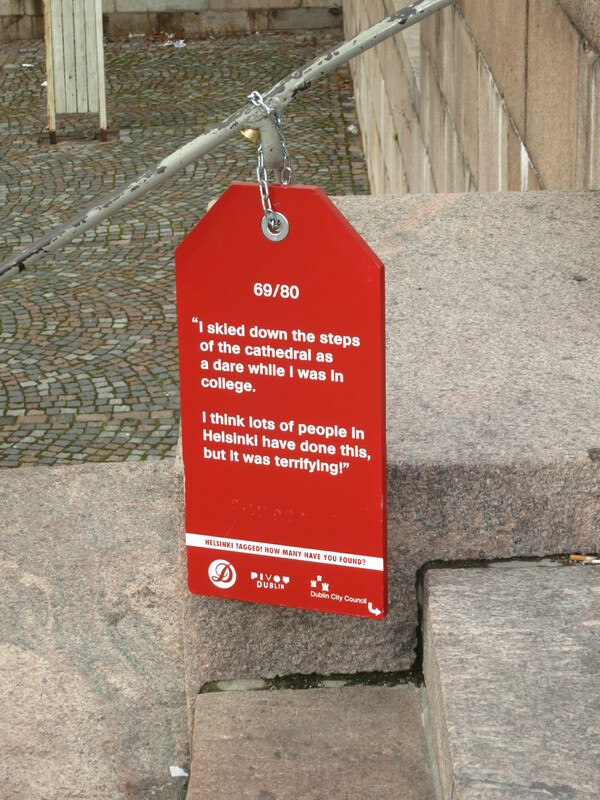 These are designed to give insight into Helsinki as well as create a fun image for passersby who read them. We were definitely amused by them, and it was fun trying to spot them as we roamed the city. As we wound our way into the city center, admiring the public art, we soon found ourselves at the train station. I should have known this was where Phil was leading us. He loves trains and is very curious to see all these European train stations he has heard so much about. 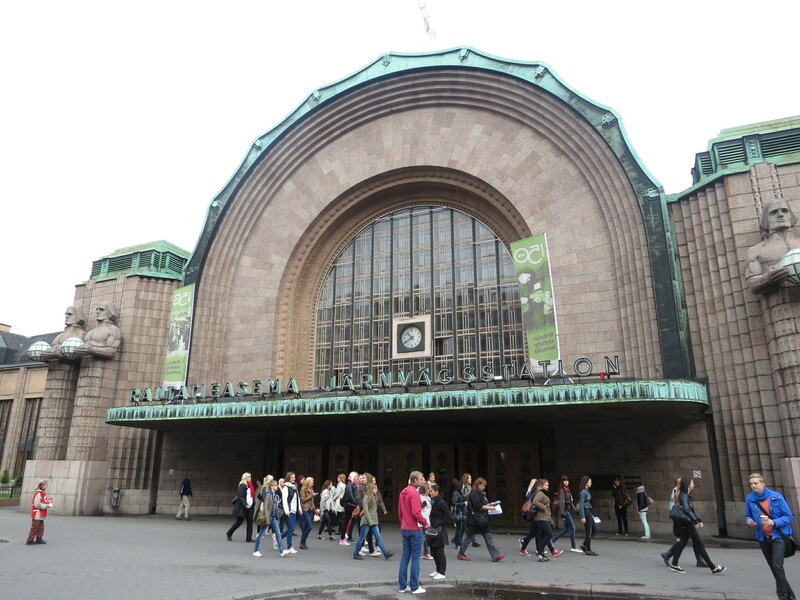 Helsinki’s station is not quite as classic looking as Copenhagen’s, but it is still very impressive. It was clearly designed for functionality, with large open spaces where people can easily find the train schedule or wait for arriving passengers. Luckily for us, they had a small exhibit featuring the history of trains in Finland, including a discussion of how to build a system which works all year even through copious amounts of snow and ice. As it turns out, it is more effective and efficient to have people maintain the signals so they stay free of ice and other obstructions. They tried to do it automatically, but it didn’t work. Not sure that’s a job I’d like to have, but hey, someone has to do it! After the train station, we stumbled into the Helsinki Cathedral, a Finnish Evangelical Lutheran Cathedral which was built in 1852. This beautiful, old cathedral is still in use today and the majority of the Finns in Helsinki belong to this parish. 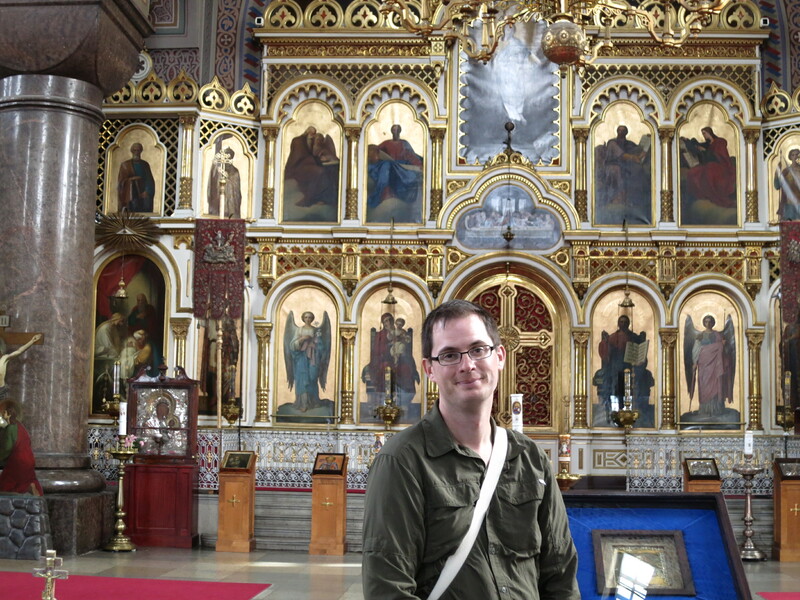 As with most cathedrals, this one is filled with artwork and sculpture. We were particularly taken with the sculptures of the 12 apostles which dot the roof. When we endeavored to name all 12 of them, we came up short by about four. At least we knew some! We ventured inside and discovered we had arrived just in time to wander around for a few minutes before it was closed to visitors due to accommodate a midday service. From the steps of the cathedral we could see much of the city. We looked on the horizon and spotted another cathedral, so we decided to head towards it and find out about it. 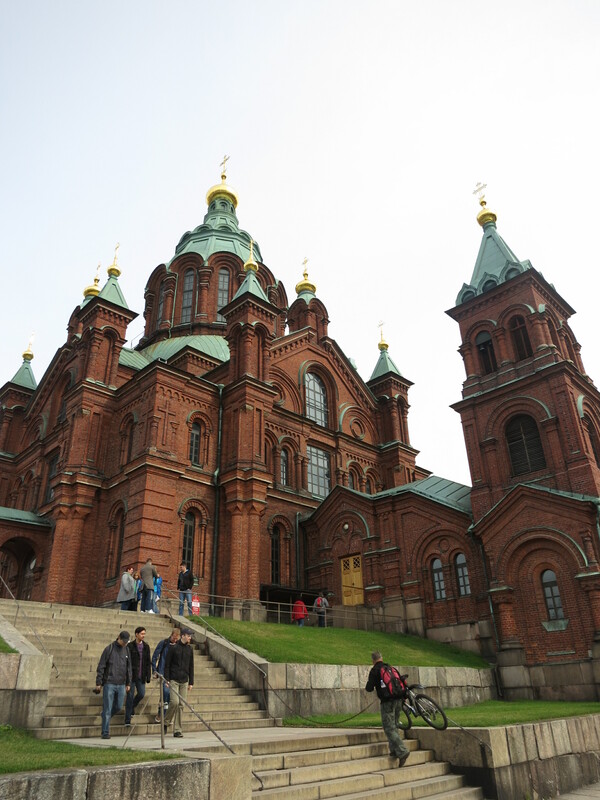 This red brick building turned out to be the Upenski Cathedral, the main cathedral for the Finnish Orthodox Church which also claims to be the largest Orthodox cathedral in all of Western Europe. That is a bit surprising to me since it didn’t seem all that large. And just like the Orthodox cathedral in St. Petersburg, there are no pews or chairs since everyone is expected to stand. Why? Don’t they want people to come to services? Give ’em a chair and I bet attendance would soar! By this point we had definitely had enough of cathedrals on our improvised self guided tour, so we headed toward the waterfront and the open air market. As we were walking there, we heard a band playing, saw men in uniform marching and a processional of some important looking people walking into a large, gated building. A crowd gathered around watching, so we figured something important must be happening. We stood for a bit, watching the band and soldiers march by playing music which can only be described as patriotic. (For all I know it could have been the Finnish National Anthem, it isn’t like I would have recognized it!) Once the band had marched away, we headed across the street to inquire as to what we had just seen. 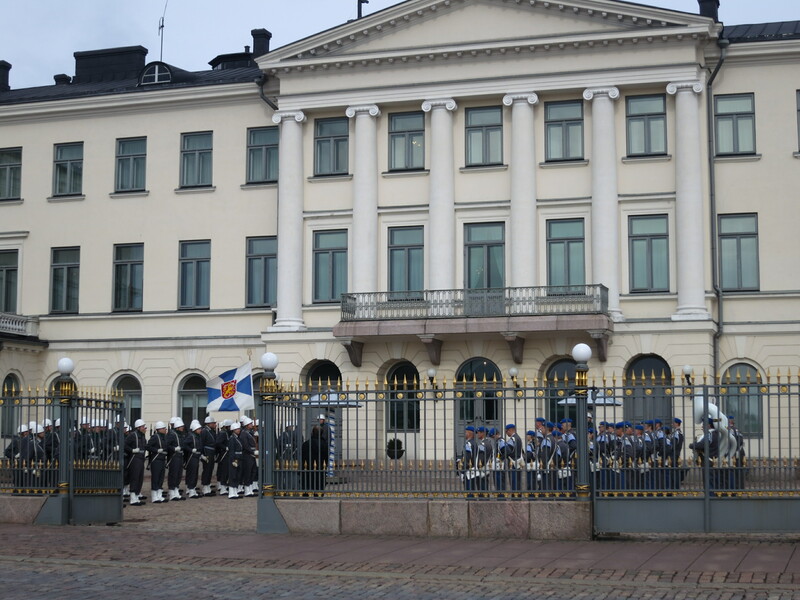 Apparently, this was the formal welcome for the new ambassador from Norway and this building we watched them go into was the Presidential Palace. It was pretty awesome that we just happened to be at the right place and right time to see this event. What a welcome! We wandered through the market for a while, seeing that the main handicraft in Helsinki is knitting. Sweaters, hats, gloves and socks abound in this market and I’m sure if you live in such a cold climate, these become life’s essentials. The sky began to look ominous, so we decided to grab a late lunch and then head back to the ship. We weren’t wrong about the Ca–it started pouring as soon as we began the 30 minute walk back. We were wet and cold. Luckily, Norwegian had set up hot chocolate and cookies to welcome everyone back on board. The weather continued to get even worse and the wind really kicked up. It wasn’t an hour after we got on board that a rumor began to spread throughout the ship–our next port of call, Stockholm, Sweden, may have to be skipped. Much speculation and distress occurred and finally after a few hours, the captain came on and told us that due to the weather we would not be going to Stockholm. Apparently they weren’t concerned about getting into the port, but they were concerned we might not be able to get out and get back to Copenhagen. Of course, we were very disappointed, but after seeing the 6 meter swells in the water, it started to make sense. Thank goodness I was wearing that motion sickness patch–there were a lot of green faces on the boat! And so, great day in Helsinki but sadly no Stockholm for us. That means we have 2 days at sea on the Norwegian Sun. Free food, music, open casino and activities all day. Sleeping, reading, hanging out in the hot tub. I suppose there are worse things! Upenski Cathedral, a Finnish Orthodox Cathedral in Helsinki. 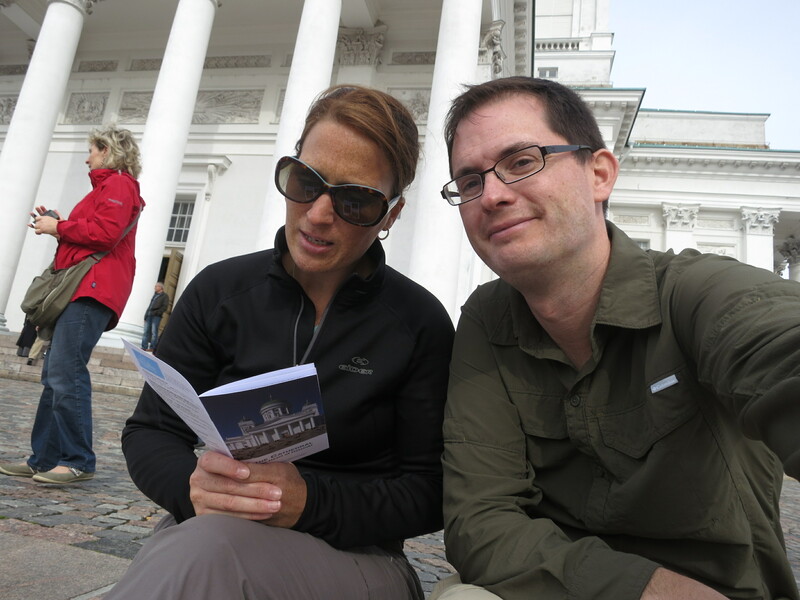 Sittiing on the steps in front of Helsinki Cathedral. Helsinki Tagged, public art example. 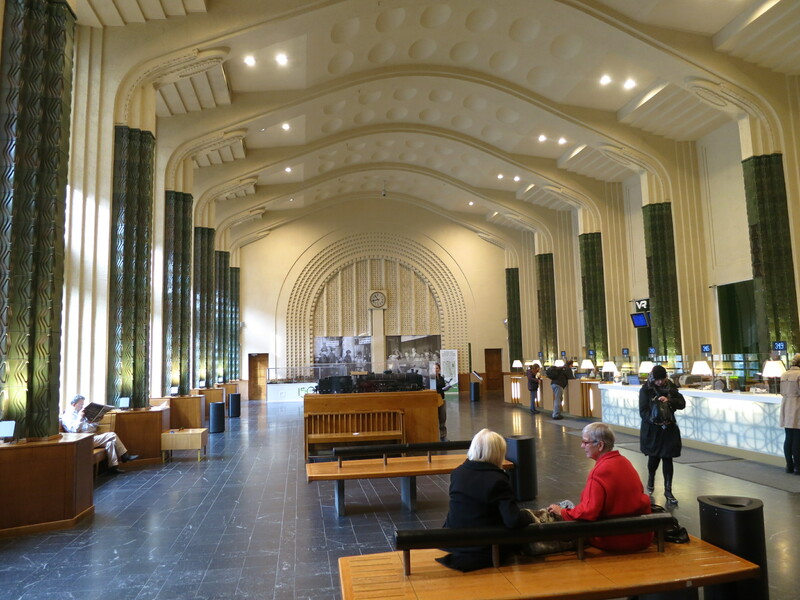 This is the inside of the Helsinki train station. Simple, functional and beautiful.